With celebrities and models, (most notably Cara Delevingne) sporting more natural and intense brows, gone are the days of thin, over-plucked looks. It can be hard though to transition into the look since we've all been told by mainstream media that we need to get our eyebrows waxed on a regular basis. 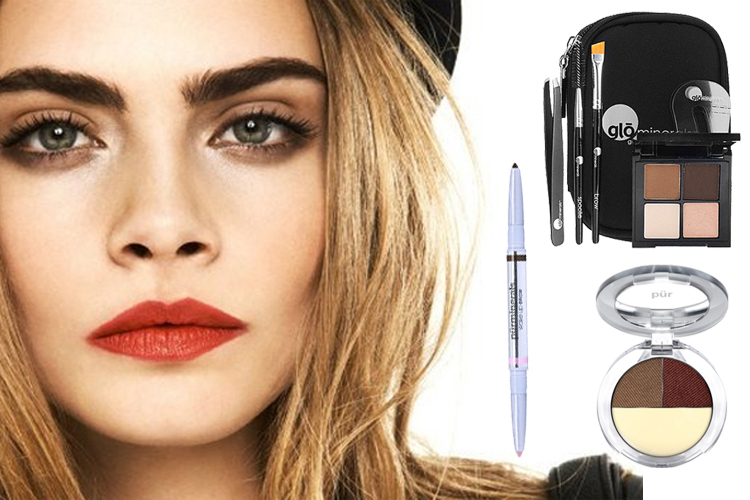 Bold Brows are achievable through a few key products and practice! Brow Pencils are the most common tool, filling in brows for a more defined shape. Brow Powders also fill in brows, but give a softer look. Brow Gels will fill in brows and keep the hairs in place. If you're a pro at shaping and filling in brows, then you probably already have some favorite tools and techniques of your own. If you're still kind of new to the trend, try multi-use or foolproof products. gloMinerals gloBrow Collection comes with everything you need to get Bold Brows - stencils, tweezers, brushes, and a palette of brow powders, highlighter and wax to keep hairs in place. Even a beginner can get it right with this kit! Pur Minerals Wake Up Brow Dual-Ended Brow Pencil is a new 3-in-1 pencil that we all can't wait to try! One end is your brow pencil and the other a highlighter that brightens eyes. A little brush is also included to clean up your brows. And, if you realize you added a little too much to your brow shape with the brow pencil, just go over it with the highlighter to fix mistakes and really make eyes pop! If you're worried about finding the right color to fill in your brows, Pur Minerals Brow Perfection Trio is for you! It features two powder shades that complement all hair colors and a wax to help shape brows and hold onto the color. What do you think of the Bold Brows trend - are you on board or skipping it this season? Let us know!